Many cancers affecting the lower extremity have been described in the literature. As many podiatrists continue to fill roles as leaders in wound care, the burden and opportunity of recognition comes to the forefront. Chronic wounds can be great masqueraders of neoplasia. This case presents the diagnosis and treatment of a 48 year old male with squamous cell carcinoma of the foot as well as a review of pertinent literature. 2 Golden Triangle Foot and Ankle Specialists, PA, 6260 Delaware Street, Beaumont, TX 77706. 3 University of Washington Medicine, Valley Medical Center, 400 S. 43rd Street, Renton, WA, 98055. Squamous cell carcinoma (SCC) accounts for 15-39% of all skin cancers . A subtype of SCC which arises from scars and non-healing wounds is Marjolin’s ulcer (MU) [2-5]. Rudolf et al found a rate of metastasis of SCC to be 2-6% with MU having 18-38% metastasis . A study of 480 isolated cases of SCC showed incidence on limbs to be 26.8 % . For MU, the lower extremity was involved in 53.3% of isolated case reviews . 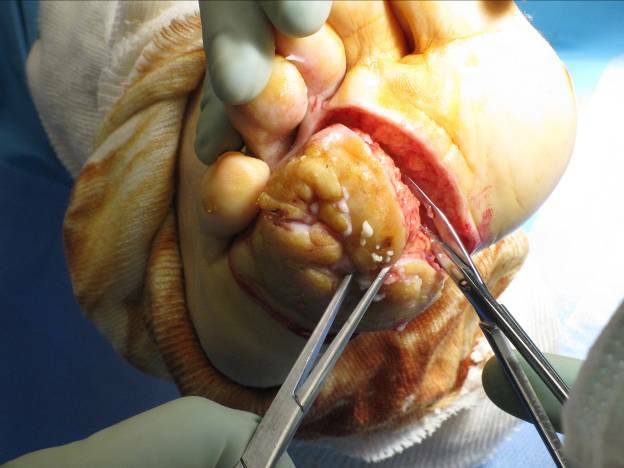 More specific to the foot, Langstein et al showed 2/18 cancers of the foot requiring a free flap for reconstruction were SCC . A 48 year old Caucasian male presented to podiatry clinic upon referral from his primary care physician for a chronic right foot wound. His past medical history consisted of hyperlipidemia and no past surgeries. The patient related a history of methamphetamine use in the past, quit for several years secondary to incarceration. The plantar right forefoot wound had been present for 6 years at time of presentation to our clinic. The area of concern began as a callus, which later became infected after self-debridement. Multiple courses of oral antibiotics, prescribed by his primary care physician, failed to resolve this wound. The primary care physician also debrided the wound on a separate occasion. The patient related no other treatments, and noticed the wound exhibited a gradual change in appearance and was slowly increasing in size. MRI was obtained prior to his arrival in podiatry clinic because of concern for osteomyelitis associated with this wound. The radiology report included a slight increase in signal intensity on STIR images in the 3rd proximal phalanx without cortical erosion or definitive abscess. Physical examination revealed a 6 by 5 centimeter isolated soft tissue mass to the plantar surface of the right forefoot with the central portion at the 3rd metatarsal head (Figure 1). The lesion exhibited a raised, lobulated appearance from the surrounding normal plantar skin surface with central ulceration that probed directly to underlying bone. The wound produced a mild serosanguinous drainage from the ulceration, but otherwise no acute signs of infection were present. No structural deformity was noted and neurovascular status was intact. Figure 1 Raised, lobulated, ulcerative soft tissue mass on the plantar foot. The patient was taken to the operating room 2 days after initial presentation for excisional biopsy (Figures 2a,b,c). A wound VAC (K.C.I., San Antonio, TX) was placed on the soft tissue deficit created. Pathology interpretation revealed a well differentiated squamous cell carcinoma in which the lateral borders were free of tumor, but the deep margins remained involved. Oncology was consulted and a full body CT scan revealed no metastatic disease. 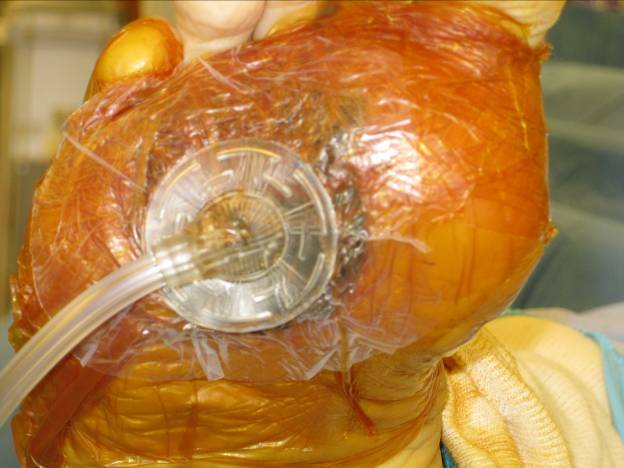 The first VAC change took place on postoperative day 5 (Figure 3), and the patient returned to the operating room on postoperative day 7. Based on the pathology interpretation of remaining tumor in the deep margins of the specimen and the subtle MRI findings previously, the third metatarsal head and third proximal phalanx were removed. Frozen sections of this tissue demonstrated clear margins. The wound VAC was reapplied. The patient returned on postoperative day 9 for repeat debridement. All tissues were noted to be viable and vascularity remained to the 3rd digit. Integra Bilayered Wound Matrix Dressing (BWMD) (Integra LifeSciences, Plainsboro, NJ) was applied directly over the exposed bone, tendons, and neurovascular structures with a wound VAC. The patient was discharged from the hospital with twice weekly wound VAC changes that produced a predominantly granular tissue bed. Figure 2 (a) excisional biopsy of mass, (b) remaining soft tissue defect with exposed third metatarsal head and flexor digitorum longus tendons, (c) VAC application to soft tissue defect. Figure 3 Appearance of soft tissue defect at postoperative day 7. The patient’s postoperative course continued without complication. Twenty days later (postoperative day 29), the patient returned for split thickness skin graft (Figure 4). The graft incorporated leaving only a minor central wound which healed without difficulty (Figure 5). At one year after initial excision the surgical site remains closed and without signs of recurrence. A high index of suspicion must be held by practitioners dealing with wounds and skin lesions for any malignancy. Regardless of the mechanism of the disease, biopsy and subsequent histopathologic analysis is the only way to diagnose suspect skin lesions. With ample history and a high index of suspicion, skin malignancy can be diagnosed in a more expeditious fashion. Figure 4 Increase in granular tissue after application of Integra BWMD, prior to split thickness skin graft application. Figure 5 Small remaining soft tissue defect that resolved uneventfully. Ruling out metastatic disease is also important and can be achieved by sentinel lymph node biopsy and CT scanning can indicate areas of lymphadenopathy and metastasis . Treatment for lesions such as SCC and MU is excision of the lesion with margins clear of disease. Finding clear margins is only found histologically and using frozen specimens while in the operating room helps reduce total treatment time. Definitive reconstruction can be planned when initial clear margins are found and may include primary closure, local tissue transfer, tissue substitutes, split thickness skin graft and free tissue transfer. Surgical management must be performed with experienced oncologic consultation for pre and postoperative planning pertaining to necessity of radiation and chemotherapy.